Warm summer evenings are meant for porch swings. 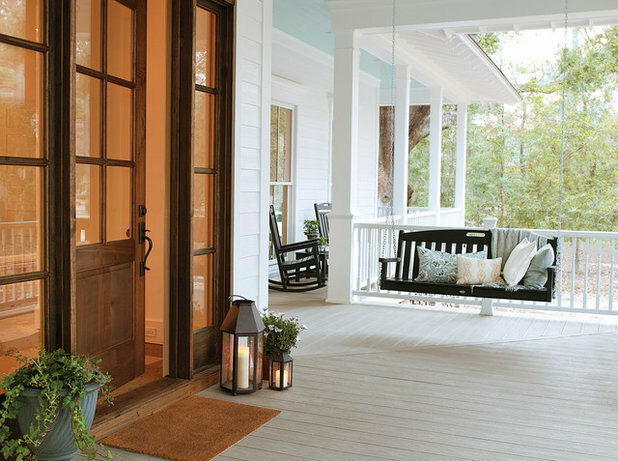 Hanging one from a porch or an arbor is a fairly easy weekend project. There’s hardly anything more relaxing on a warm evening than swaying on a porch swing and watching the world go by. 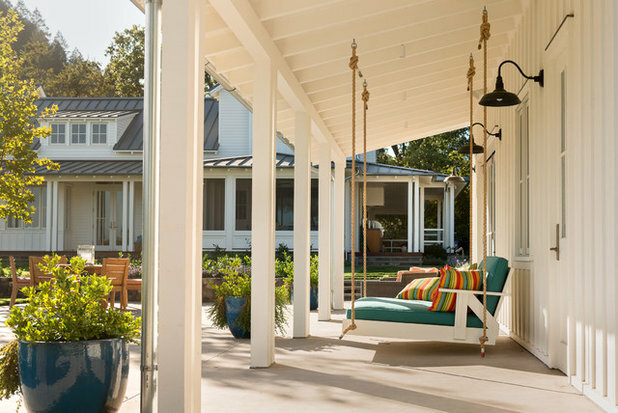 Hanging a porch swing is easier than it might seem: It requires only a few tools, some careful measurements and a little homeowner handiness (or the right professional). Get started this weekend, and soon you’ll be able to sit back and enjoy what may be your new favorite seat inside or outside the house. 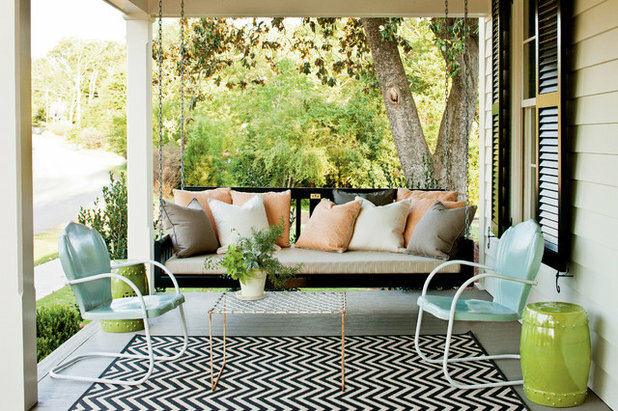 Keep reading to learn how to hang a porch swing or daybed from your porch or an arbor. 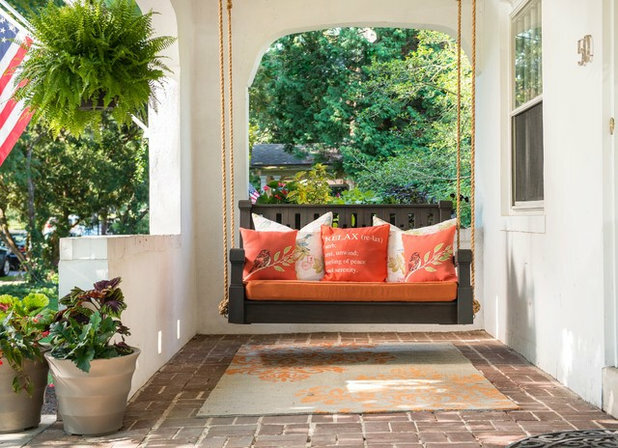 Note: Many porch swings come with a hanging kit that includes all hanging materials needed. If you purchase a swing chair that includes a hanging kit, follow the manufacturer’s instructions for mounting. 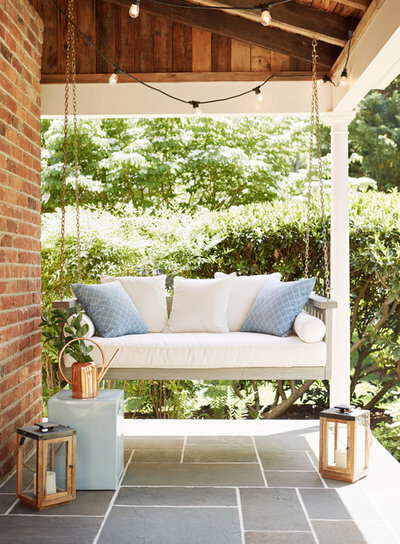 Check that your porch can support a porch swing. Before the fun part of picking out a porch swing, make sure your porch is strong enough to support one. Use a stud finder to look for ceiling joists, the thick overhead beams that support a ceiling, to which you can anchor the swing. If you’re unsure, hire an experienced home builder or contractor to take a look. Choose a porch swing. 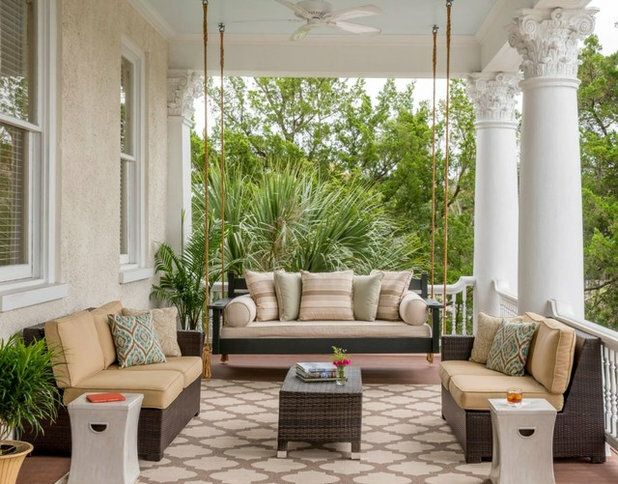 There are plenty of porch swings on the market, in styles that range from classic wooden benches to backless, platform-like seats and 4-foot-deep daybeds. 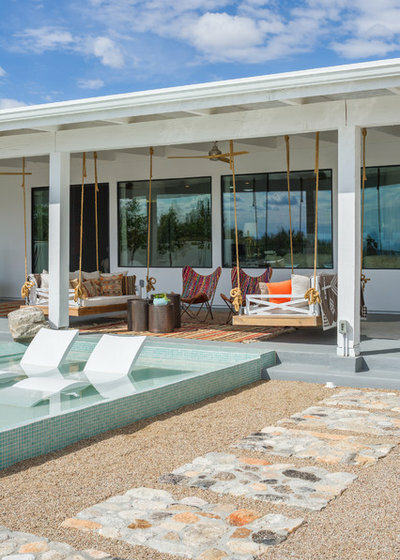 Look for swings made of durable outdoor-friendly materials like coated metal or rot-resistant woods like redwood and teak for a long-lasting swing. 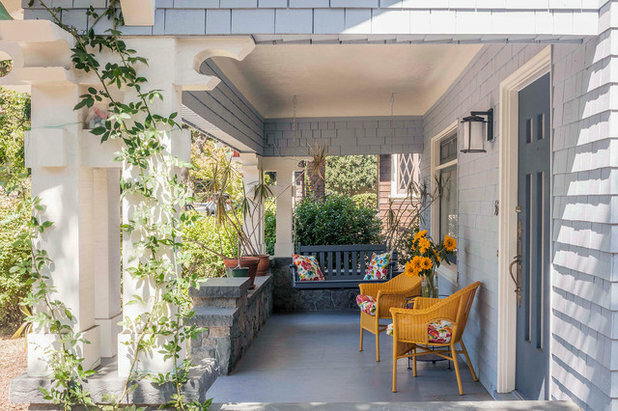 Choose a style that complements your porch and the architecture of your home. 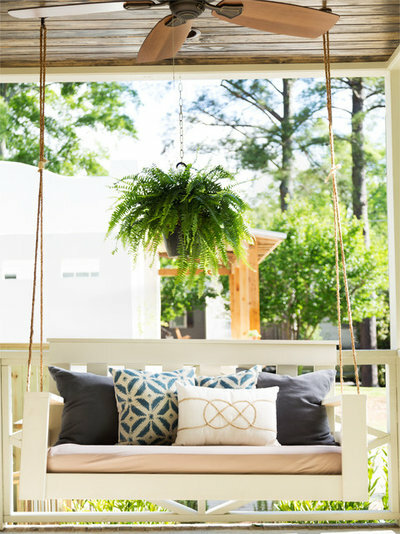 You can also turn a bench you already have into a porch swing — as long as it’s sturdy enough to be suspended by the corners — by drilling eye bolts into the sides and hanging it. 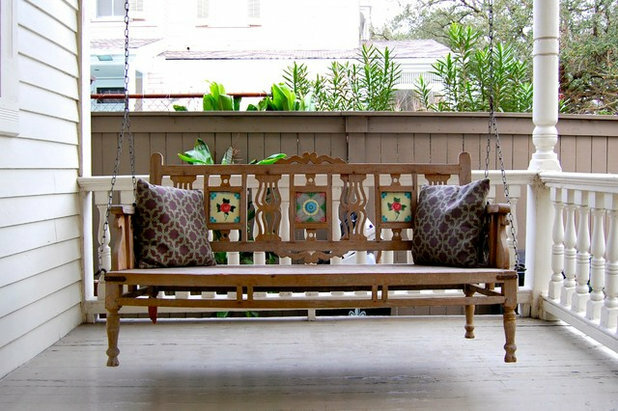 The owners of this porch swing used a vintage Indian teak bench as a porch swing outside their New Orleans home. 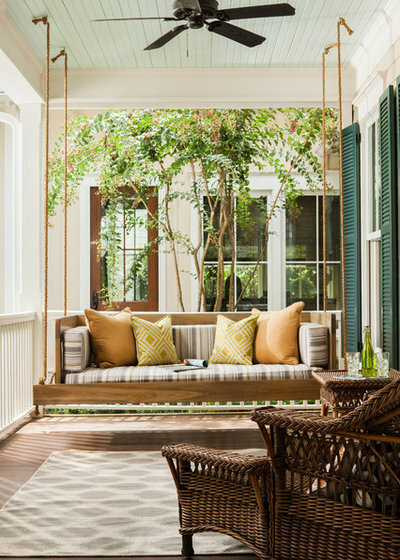 How much space you’ll need for a porch swing depends on the size and style of swing you select. In general, you’ll want to have at least 4 feet of space for a standard bench swing to swing back and forth, and more space as needed. Leave at least 14 to 16 inches on either side of the swing for clearance. Swings mounted on two chains, rather than four, require a larger space for the arc of their swing (add 2 to 4 more feet of clearance). Swings mounted on four widely set chains (a common setup for daybeds) don’t swing in an arc as much as move back and forth. Therefore, they require less additional space to account for movement. Tip: When planning, it can be helpful to mark a swing clearance box on the porch floor using painters tape. Decide to hang with chains or rope. 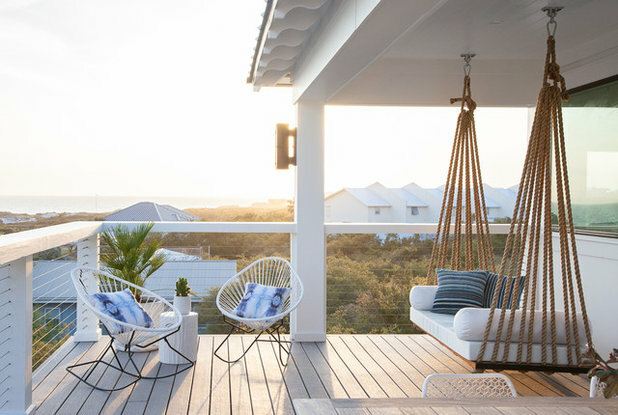 Galvanized steel chains or thick marine-grade rope are the most common methods for hanging a porch swing. Select whichever material you prefer based on look, feel and durability, or use the chain or rope included with a porch swing. Many porch swing chains come with two long chains and two short chains. The short chains attach to the arms and back of the swing and then come up about 2 feet above the chair to form a triangle. The longer chain attaches to the ceiling.Chains offer the advantage of being completely weatherproof and friction-proof and will not fray over time as a natural fiber rope does. Ropes, however, feel nicer to the touch. If using ropes, you’ll usually need four 7-foot-long sections to attach to each arm and the back corners of the bench. 1. Attach hooks to the swing. If your porch swing doesn’t come with pre-installed hardware, attach your own. Where to install the screw eyes depends on the style of your swing. In general, install hooks on the outer sides of the swing in even, opposite points where the swing will then hang in a balanced way. For daybeds and deep platform-style seats, attach four screw eyes (two on each side) to the swing base, setting them back about 3 inches from the corners. For classic bench swings, attach two screw eyes to the outsides of the arms, set back a few inches from the end, or to the bench seat below the end of the armrest (as pictured here) and two more on the backrest, a few inches above where the armrest meets the backrest. For either setup, drill a pilot hole first and then screw in the screw eyes by hand. 2. Locate ceiling joists. It’s best to anchor into a joist when hanging a porch swing. Joists are the structural beams (usually either a two-by-six or a two-by-eight) that support the ceiling of a porch. Use a stud finder to locate ceiling joists and mark both sides of the beam and the approximate center of the beam, which is the ideal spot to mount the anchor. Don’t have joists in the right spot for your swing? If thick ceiling beams don’t happen to fall where you need them, install short beams (four-by-four) to span multiple joists. Position the short beam so it’s where you need it for hanging the swing, and then use 3-inch screws to secure the short beam to multiple joists. Proceed with the next steps, attaching the hanging hardware directly into the short beam. 3. Measure and mark where you’ll hang your swing. Set the spots for the hanging hardware between 2 and 4 inches wider than the length of the swing. For example, space the hanging hardware 62 to 64 inches apart on the ceiling for a swing that is 60 inches wide. This prevents the chains or ropes from rubbing against the sides of the swing. Do a final check on your measurements for mounting the swing to the porch, lining up where the center of the swing would fall and marking ceiling joists. You can choose to have either four ceiling anchors or two, depending on your swing style and setup. 4. Attach hanging hardware to porch. Once you’re set with measuring and marking where you’ll hang the porch swing, pre-drill holes for the screw eyes into the ceiling and screw them in by hand. If you’re anchoring onto a short beam between joists, you can also drill all the way through the beam, screw in a bolt and anchor the other side with a washer and nut. Add comfort swing springs, if using. Comfort swing springs add some bounce to a swing and can make for smoother swinging. If using, attach to each ceiling anchor, between the screw eye and the chain or rope. 5. 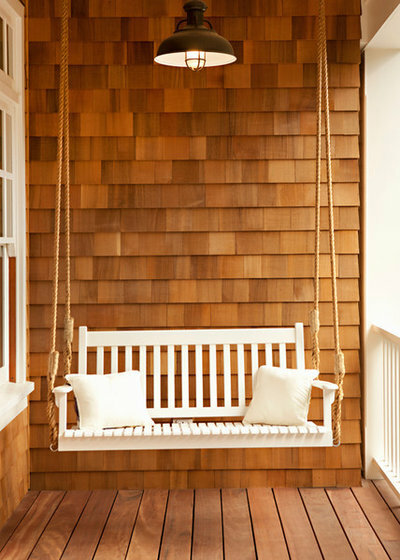 Hang porch swing. It’s optimum to hang your swing 17 to 19 inches off the ground. If you’re using 7-foot-long chains or sections of rope and hanging a porch swing from a standard 8-foot-tall ceiling, it will fall somewhere in this optimum height range. For both hanging methods listed, it’s helpful to have a friend hold up the swing while you’re working on mounting. Chains: For chain hanging systems that use two ceiling anchors, you’ll use a short chain and a long chain on each side of the swing. (Swing chains usually come this way). On each side of the swing, attach the end of one short chain to the screw eyes in the arm and back of the chair, bringing the chain up to form a small triangle. Use an S-hook to attach the longer chain to the middle of the short chain (at the point of the triangle). Then, attach the long chain to the screw eye in the ceiling with another S-hook. Check that the swing is level by using a level or by counting chain loops. Rope: Loop four sections of at least 7-foot-long ropes through the four screw eyes on the corners of the swing and connect to the corresponding screw eyes in the ceiling. Knot the rope to hold the swing in place. Use a level to check that the swing is even. Wait to trim the ends of the rope until after you’ve tested the swing. Add a slight tilt. 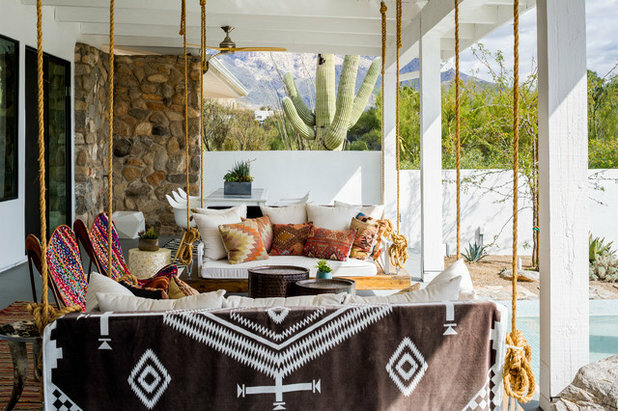 Porch swings and daybeds with a seat back are often more comfortable if the back of the seat hangs slightly lower than the front of the seat. In four-rope or chain setups, before tying off ropes or anchoring the chains, you may want to consider adding 1 inch or one chain link to the two back ropes or chains. If you’re using the triangle chain setup (long chain combined with smaller chain), attach the long chain one or two chain links off-center on the smaller chain, placing it closer to the front of the chair to tilt the seat back. Give it a swing. Once the swing is mounted, sit down and give it a go. Adjust the chains or wires as necessary if one side feels slightly lower than the other, and adjust the height of the swing as desired. Once you’re happy, trim the excess ends from the bottom of the ropes or knot them up the sides. Excess chains can either be cut with a bolt cutter or hooked into a loop. 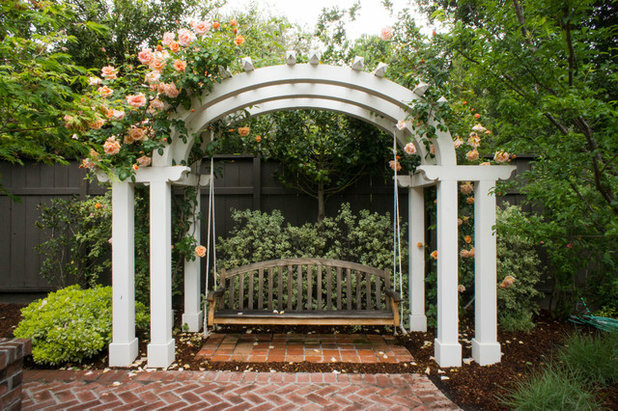 You can follow the same general steps to hang a swinging seat from an arbor, pergola or under a deck, providing that the structure is strong enough to support a swing.